You always want to do the best for your horse. So if it appears unwell, in pain, or “out of sorts” - you want to do whatever you can to help. But it's not always easy knowing what exactly the problem is. Vets do an amazing job of course - but sometimes things just aren’t very clear. Imagine how helpful it would be if your horse could tell you what it really needed? Whilst it can’t tell you directly, zoopharmacognosy enables it to show you - very clearly - by self-medicating on plant extracts with surprising deliberation when given the opportunity. Whether to support physical challenges, behavioural issues or those situations where there is nothing obviously physically wrong, but the animal is clearly not thriving - self-selection allows your horse to take whichever medicinal compounds it needs, in the quantity it needs, and in the way it needs it. A laminitic horse that’s been put on a basic diet may need highly nutritious plant powder with the sugar removed. But which one(s)? And how much? A horse on box-rest might need extracts to reduce frustration, gel to soothe a weight-bearing leg, or extracts to support healing, all these need consideration in addition to the main reason for the box rest. A horse that appears to have behavioural issues will often select plant extracts that contain pain-killing properties, even though there is no visible evidence to suggest it is in pain. The chance to self-medicate not only gives your horse a choice - it gives it a voice, the opportunity to let you know what it really needs. As a Zoopharmagocnosist, I facilitate self-medication for horses. I do not diagnose or “treat” – I enable the animal to self-select by offering pure, natural plant extracts in a safe and species-appropriate way. I work with natural extracts such as essential oils, base and macerated oils, aromatic waters, dried and powdered herbs, beeswax and clay powder. I offer extracts that I believe are most likely to be relevant for your horse, based on the in-depth client consultation. This sounds straightforward but must be sensitively paced, and directed by the animals responses - some of which mean the opposite of how they appear, to the untrained eye. I explain what's happening throughout the session and happily answer any questions you have. Your horse must have the freedom to “choose or refuse” at all times, and you will be fascinated watching their responses. Horses have a very special relationship with plants, both as food and medicine. Your horse has an amazingly sophisticated sense of smell. The brain communicates with the nose when the horse needs medicinal plants - it's all about chemical messages. The horse isn’t deliberately choosing “nice” smells or tastes - it is responding to messages from the brain. It's really important to realise that selecting medicine is not the same process as selecting / eating food. Your horse will not "eat everything" I offer it - that's a promise. More clever messaging from the nose to the brain means your horse stops medicating when it has taken what is needed. 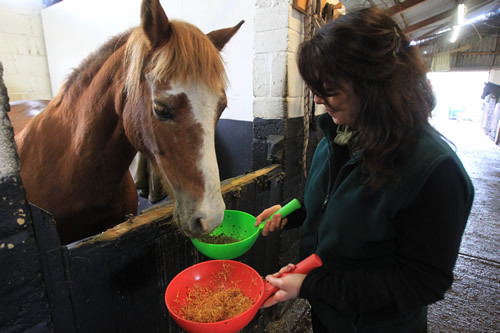 Firstly, self-selection is a wonderful preventative health approach, enabling your horse to support its immune system. This is only ever going to be beneficial, so don’t feel you need to wait for an “issue” to arise before booking a visit. If your horse has any symptoms giving you serious cause for concern, you should always speak to your vet first - zoopharmacognosy is not a substitute for veterinary advice**. However, it can be an amazing additional “tool in the box” for animal wellness and hard-to-resolve issues. COMPETING: It is important to note that most oils / extracts used have not been formally drugs tested. It is recommended that they should not be offered at least 10 days prior to any competition participation. Holistic approach: a simple injury might see your horse selecting a combination of extracts that support cell repair, inflammation, infection, pain, trauma, shock, anxiety! Zoopharmacognosy is fascinating to observe. You will gain a new understanding of your horse, and be able to use what you learn to support its physical and emotional balance in the future. By giving your horse a choice, you give it a voice.